the kennedy blog: Weekend Update... A week later. Weekend Update... A week later. So I'm kind of cheating the "weekend update" system here for another week in a row... But with the wedding coming up THIS WEEKEND I've had to do a bit of "pre-posting" and haven't had a lot of time to squeeze in all the juicy updates along the way. This "update" is short and sweet, as you already heard a little bit about how the weekend began. If you missed the bachelorette post, you can get caught up here. After the partying ended, the family part of the weekend commenced. 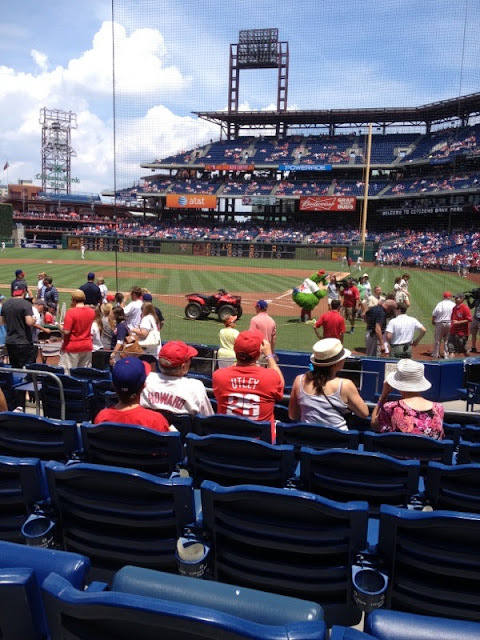 Nick and I were reunited on Sunday afternoon after being at our respective celebrations and enjoyed the HOTTEST day of our lives outdoors watching our beloved Phillies with his family right behind home plate. I don't normally say this, but thank goodness for scalpers. You guys these seats were amaze-ing and didn't cost nearly what they should have. And because it was HOT as you-know-what we were thanking our lucky stars for said seats. 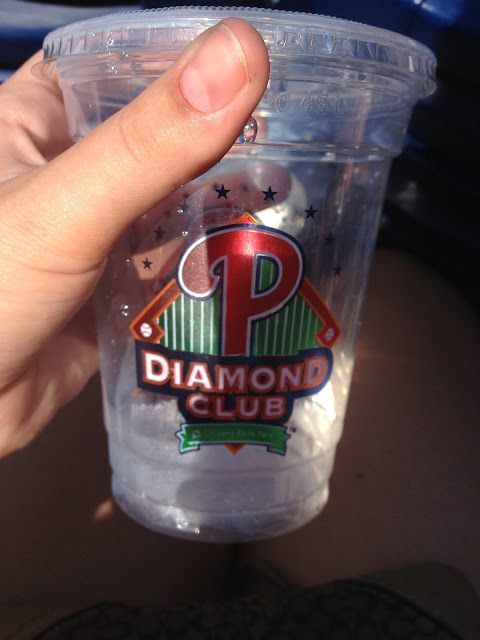 Being a part of the "diamond club" means unlimited water/ice cups and an air conditioned lounge with food, plenty of TVs, and cleaner bathrooms. We [as in every single person in the park] were all hot sweaty messes, but still managed to fake presentability for a couple photo ops. Not to mention, now I have some awesome pictures to add to the annual family calendar :) Here's one of the whole gang at the park. Can you tell we were all sticky and gross, but extremely happy to be together?! And to top it all off, the Phillies actually won! I have yet to be at a game where they did, so I was glad that that curse was finally lifted!